I have to confess...I am a Prima hoarder. If there's anything worth a fortune in my house, it has to be my Prima collection. I have an entire drawer overflowing with Prima canvas, flowers, leaves, vines, charms and crystals. It's so bad that I dread to open the drawer because 1) I am filled with guilt at how much I have spent and 2) It's getting more and more difficult to find stuff and 3) close the drawer after I have spent at least 10 minutes searching for that particular Prima item I remember I owe. It must be an open secret at Made With Love, otherwise Aida would not have assigned this week's product focus to me. And it's all about Prima!!!Lol. I had some scraps leftover from my Prima Madeline papers which I could not bear to throw away, so I used them on this layout, combining with the crystal lace and ribbon to form a background on the white cardstock. 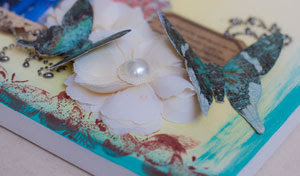 As usual, I can't resist misting and splattering a little paint over the white cardstock to 'liven' the look a little. 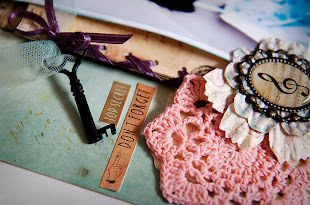 I used a canvas tag to matt the photos onto and the large aqua flower was from Prima's recent CHA ribbon collection. I topped it off with a 3-dimensional flower center from Prima. 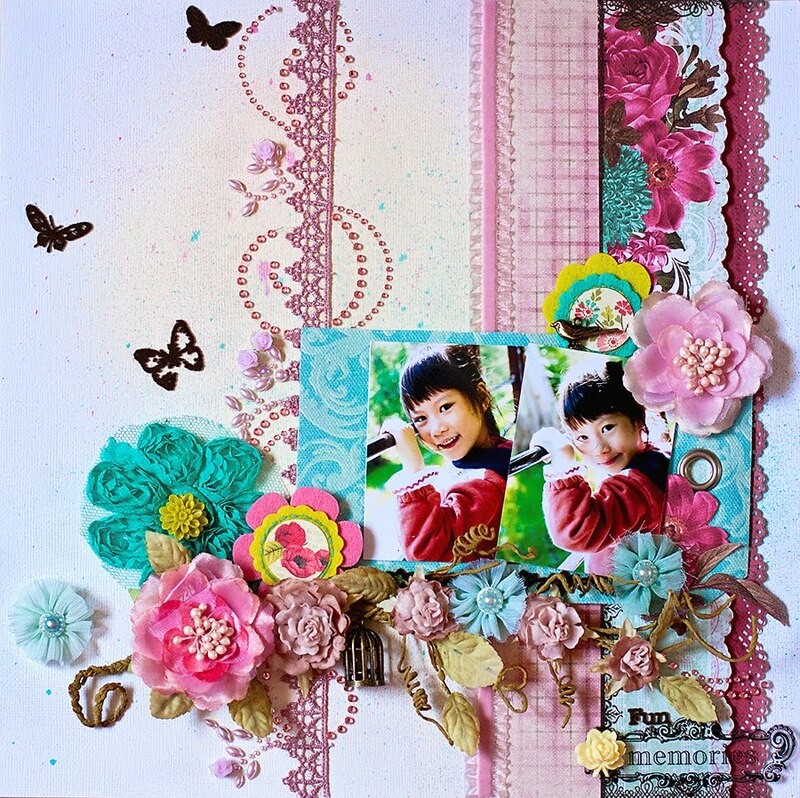 The charms there, are the new products from Prima's recent CHA. 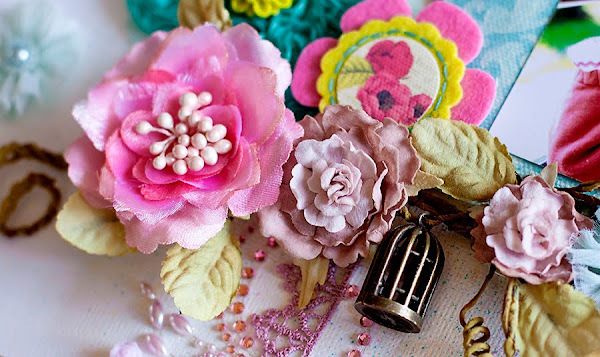 Prima came up with various metal trinkets and embellishments, good for embellishing, mixed media and even for jewellery making! Another one of my Prima faves is the flocked rub-ons. The texture is amazing! I love the embossed look and feel of the felt when I run my fingers over the rub-ons and I wish I had gottten more of them... They are so versatile and can even be used with other product lines! 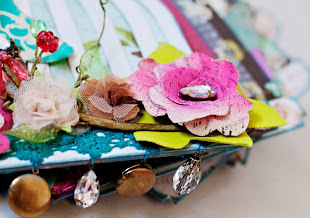 Thanks for poppong by my blog and I am so excited to be designing a class for Made With Love, using fully Prima goodness on a birdcage album from Maya Road. 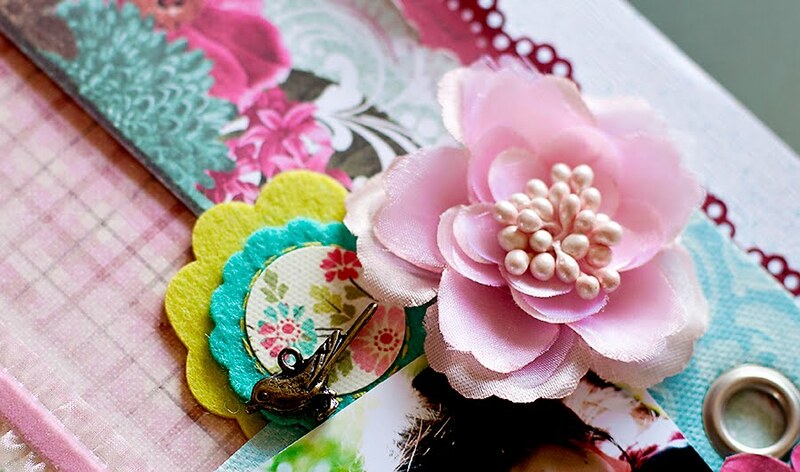 There will be nothing but the latest Prima, Prima and more Prima products to play with in this class! The class will commence in June and sneaks will be up soon! Stay tuned.